Federal data released earlier this month indicate that more than 1.3 million students enrolled in public schools during the 2016-17 school year were homeless. This represents a 7 percent increase in the number of homeless students over a three-year period and a 70 percent spike in the last decade. These numbers are troubling for many reasons: Homelessness is associated with a host of challenging life outcomes, including difficulty staying in and graduating from school. But there’s some potentially good news here. First, though tough economic conditions, high housing costs, and other factors likely led to real increases in the number of students experiencing homelessness, it’s likely that some of the increase is due to school districts simply getting better at identifying their homeless students. That’s a good thing. Schools can’t support students experiencing homelessness if they don’t know who they are. Second, the data captured in this report only include those students who are enrolled in public schools. That means that all of the 1.3 million homeless students are still enrolled in school. Their attendance may well be spotty, but they haven’t dropped out. 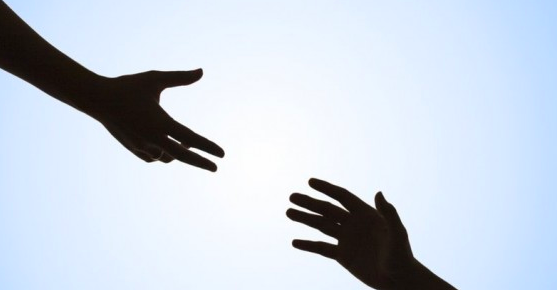 They are known to a set of adults who work in a system that can provide them with the academic support they need and can connect them to other services. That’s hugely important. As my colleague and I have written, the education system can be a powerful through-line for young people experiencing homelessness or any other destabilizing life event. As the place where the vast majority of children go every day and interact with adults, schools provide a natural central point for connecting services that can support a child’s education and meet their other needs. Want to learn more? We’ve written about the human-centered design policies and methods that take into account the real needs of students who experience disruptions to their educational trajectories. We’ve also addressed the promise of technology to support students in transition and launched a game to help build empathy and understanding about the challenges young people face as they navigate destabilizing events like homelessness, incarceration, or foster care placement. 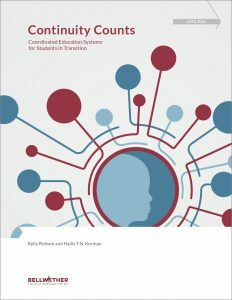 This entry was posted in Education Policy, Federal Education Policy, State Education Policy, Student Data and tagged Homeless students, human-centered design on February 25, 2019 by Kelly Robson. At any given point in time, about 5 million kids are served in one or more of our nation’s child service agencies. These young people are living through traumatic and disruptive experiences ranging from homelessness to foster care placement to incarceration. As I wrote in this piece nearly two years ago, these children are navigating a fragmented world of adults, programs, and agencies, often operating as the only central point among all of the services. In our latest publication, Continuity Counts, Hailly Korman and I offer our recommendations for addressing this fragmentation and improving cross-agency coordination. However, our project differs significantly from most other policy papers because we approached our research using human-centered design. This means that we started by talking to the very people who are impacted by agency fragmentation: the children and youth served by these agencies. We also talked to the direct-care providers working in various agencies. The goal of these interviews was to better understand the needs, wants, and constraints of both the youth and the care providers, in order to build a set of recommendations that addresses the challenges they face. Through our human-centered design approach, we identified two key levers for change: continuity of people and continuity of information. By identifying a single adult to operate like a child’s “chief of staff,” we can mitigate the need for a child to interact with a myriad of adults. By improving data collection, sharing, and storage, we can reduce the burdens on youth and their caregivers that result from missing or incorrect information. The silos that exist among agencies did not appear overnight and will not disappear quickly. However, just because agencies have always operated in relative isolation from one another does not mean it must always be like this. Eliminating, or at least substantially reducing, the fragmentation that exists among schools, government agencies, nonprofits, and community-based organizations is possible with deliberate and concerted effort over a long period of time. And doing so is necessary if we ever hope to provide youth with a cohesive, streamlined system of support throughout their education trajectories. Read our full report here or our op-ed in The 74 here. This entry was posted in Education Policy, Federal Education Policy, State Education Policy and tagged foster care, Homeless students, Homelessness, human-centered design, justice-involved youth, trauma on April 30, 2018 by Kelly Robson. In a lot of ways, the worlds of education policy and human-centered design couldn’t be more dissimilar. The former relies heavily on large-scale quantitative analysis and involves a long, complex public process. The latter is deeply qualitative, fast moving, creative, and generative. Policy professionals come up through the ranks in public agencies, campaigns, and think tanks. Deep issue expertise and sophisticated deductive reasoning are highly valued. Designers come from an array of backgrounds — the more unorthodox the better. Success for them comes from risk-taking, novel ideas, and synthesizing concepts across time, space, and sectors. I’m fortunate to have spent some time in both worlds. They each appeal to different parts of my personality. Policy analysis affords me order and confidence in answers based on facts. Design lets me flex my creative muscles, fail fearlessly, and have confidence in answers based on experience. So when a grant from the Carnegie Corporation of New York gave me the opportunity to write a paper about bringing these two worlds together, I jumped at the chance — I knew that each could benefit from the other. Creating More Effective, Efficient, and Equitable Education Policies with Human-Centered Design makes the case that policy practitioners can use human-centered methods to create better education policies because they are informed by the people whose lives will be most affected by them. The underpinning hypothesis is that 1) co-designing policies with constituents can generate more accurate definitions of problems and more relevant solutions, 2) human-centered design can generate a wider variety of potential solutions leading to innovation, and 3) the process can mitigate or reverse constituent disenfranchisement with the lawmaking process. 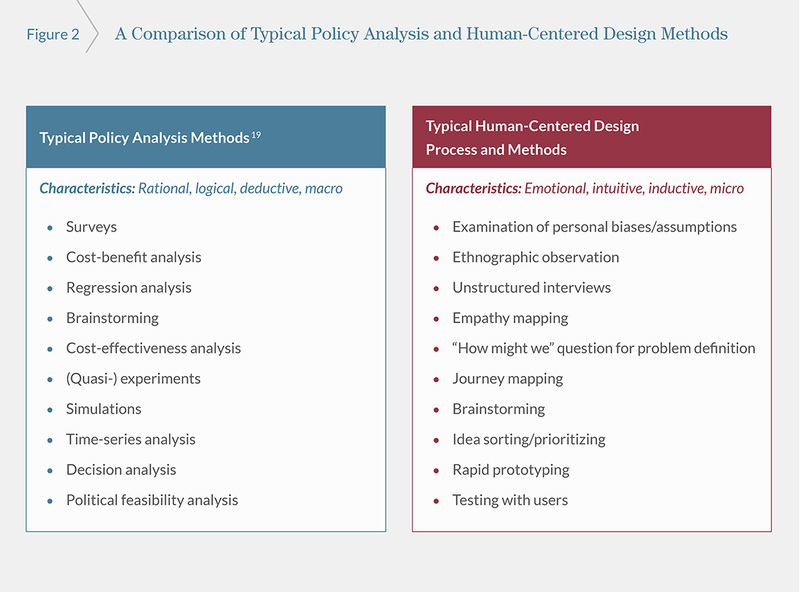 Human-centered policy design is still a new practice, however, and there are still important questions to work out, like how to make sure the process is inclusive and where exactly human-centered design methods can enhance policy research and design. Luckily, SXSW EDU, a huge national conference focused on innovation in education, is a perfect place to test new ideas. So I reached out to Maggie Powers, director of STEAM Innovation at Agnes Irwin School and member of IDEO’s Teachers Guild, and Matt Williams, vice president of Education at Goodwill of Central Texas, to explore what it would look like to apply human-centered design to policies that affect high school students whose education suffers because of lost credits when they transfer schools. Our session will pressure test some of the ideas that emerged in the paper. The results will inform the next phase of this work, which will help policy practitioners implement human-centered design methods. Keep an ear to the ground for that! This entry was posted in Education Innovation, Education Policy, Equity, Federal Education Policy, Research, State Education Policy, Uncategorized and tagged human-centered design, Research, SXSWedu on March 7, 2018 by Jason Weeby.